"We have a flock of laying hens and usually an abundance of eggs. I'm always trying to find new ways to prepare them. Oh man are they good! 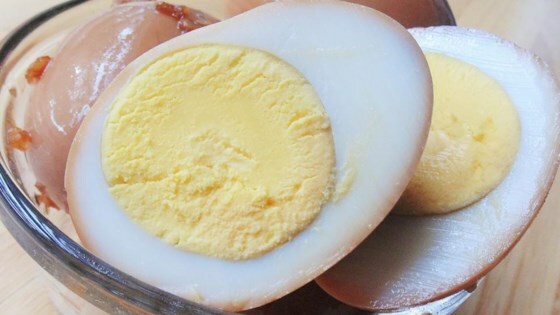 It's a unique twist to the more traditional pickled egg recipes out there. These are great on salads, or just as is." Place eggs in a large saucepan and cover with cold water. Bring to a boil; remove from heat, cover, and let sit until eggs are cooked through, about 10 minutes. Drain hot water; cover eggs with cold water. Peel eggs and place in a quart-size Mason jar. Combine soy sauce, water, sugar, minced onion, and sesame oil in a saucepan over medium heat. Cook and stir until sugar is dissolved, 3 to 5 minutes. Cool briefly, about 5 minutes. Pour over eggs in the jar. Refrigerate eggs until flavors are absorbed, at least 6 hours. See how to make restaurant-quality egg drop soup. If eggs are fresh, add a 1/4 teaspoon baking soda to the water in step 1. This makes the eggs easier to peel. Nutrition data for this recipe includes the full amount of teriyaki. The actual amount of teriyaki consumed will vary.